The Fox Farm is an intriguing part of St. Louis Park History, but there are many unanswered questions, so we hope you will contact us if you have any clarifications, corrections, or additions. Be sure to see the fascinating memoir written by the Caretaker’s daughter, Shirley Wanchena. St. Louis Park was the site of the United States Silver Fox Farm, ” breeders of the Roosevelt Strain of Mormon Fox.” The company, headquartered in Spokane, Washington, also had farms in Seattle and San Francisco. We are not sure exactly where the fox farm was. There are two different but adjoining parcels, both facing Wayzata Blvd., on either side of Texas Ave. Perhaps the farm occupied both parcels for a time. The following is a collection of clues to this mystery. A 1926 map shows that the Silver Fox Producer Assn. owned 80 acres, directly north of the Westwood Hills Golf Course, south of Wayzata Blvd. Part of that area may actually be in Golden Valley, according to county records. Most of this site is now Westwood Lake and the northern end of Westwood Hills Environmental Education Center, however, so we scratch our heads at that. Actually, it is more like a swamp, as it was drained with a ditch to Bassett Creek. In 1926 the 40 acres on Wayzata just west of Texas belonged to an M. Jerapek, but there’s no listing for him in the 1933 directory (the first one issued). The area that is Westwood Hills Nature Center was platted in 1937. Northside expert John Yngve swears that there was no fox farm west of Texas. We definitely know that there was a Fox Farm at the southwest corner of the intersection of what is now Louisiana and Highway 394, bordering on Pennsylvania and 14th Street. The 1914 map shows that the southwest corner of Louisiana and Wayzata was owned by Frank A. Turner. The surviving area that is south and east of this area was platted in 1916 and 1917. The 1926 map shows that the 19 acres between Wayzata Blvd. and 14th Street, between Pennsylvania and Louisiana belonged to a George L. Madden, who is not in the 1933 directory. 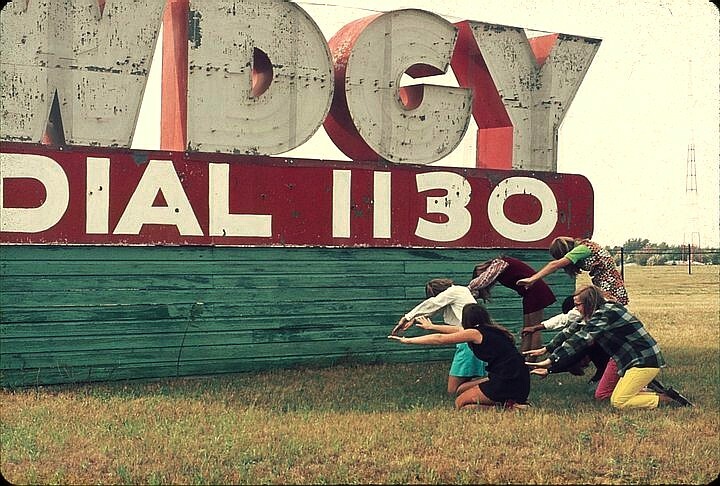 In August 1927 Dr. George Young moved his radio antenna for station WDGY to the Silver Fox Farm, described as Superior Boulevard and Falvey Crossroad: now Wayzata Blvd. and Louisiana. The address in 1955 was 7401 Wayzata Blvd. It was a combination two-bedroom house and a separate radio control room with many dials and lights. Al Lennon was an on-site caretaker of the equipment. 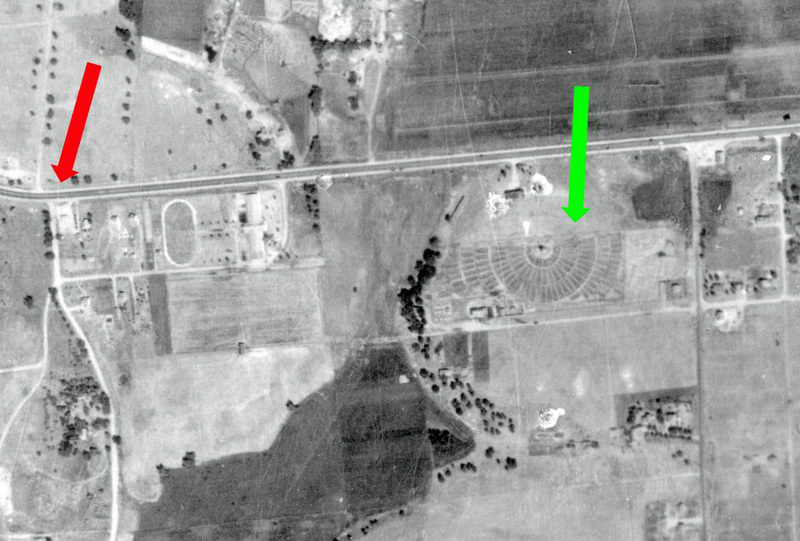 1937 aerial courtesy Marc Kenton. The green arrow marks the circular fox pens. The red arrow points to Texas Ave. In late In 1949 the station moved its transmitter to Bloomington. In June 1950, Mr. and Mrs. Edward Dobie of Robbinsdale asked to use the old WDGY building on Wayzata Blvd. as a dog kennel and residence. The property may have been removed in the mid 1980s with the coming of I-394. 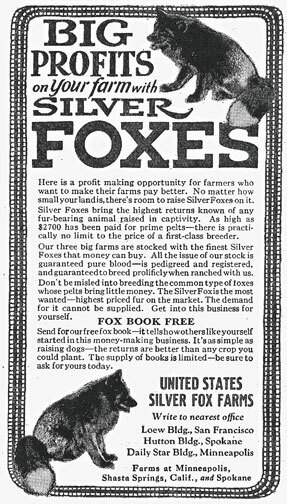 A 1928 business directory lists the United States Silver Fox Farm on Superior Blvd. 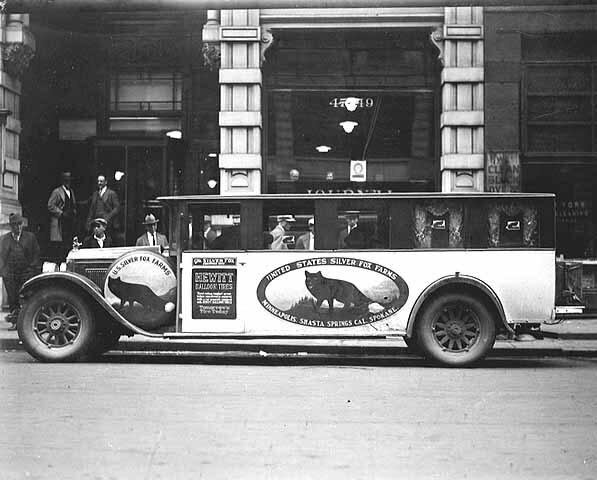 There was also the Minnesota Silver Fox and Fur Co., with a Midway address. The 1933 directory (the first one issued) lists United Fur Ranches located at Louisiana and Wayzata Blvd. The farm could be seen from Louisiana, at the top of a hill that sloped up to the south. In the 1934-35 and 1935-36 directories, United Fur Ranches is listed at 14th Street and Louisiana. The 1937 book lists United Fur Ranches at Wayzata and Louisiana, and names Dr. F.S. Swale as the proprietor. He does not appear separately in the directory. The last listing for United Fur Ranches is in 1938. In 1939 the foxes were moved to a mink ranch off of Hopkins Crossroad, about a mile south of Wayzata Blvd. The Fox Hills neighborhood off of CR 73 is where the mink ranch was. The foxes were moved again, north to Peqot Lakes in 1940. An aerial photo taken in 1945 hangs in the Westwood Hills Nature Center. On it, at the Louisiana location, is a set of concentric circles that look very much like the fox pens pictured below. The foxes had been moved by that time, but perhaps it took longer to move or dispose of the infrastruture. Houses on the block were primarily built in the late 1940s and early 1950s. Blocks have been removed at the intersection of Wayzata Blvd. and Louisiana and it is now the site of a transit center. From at least 1933 until 1938, O.C. Ward’s Stables were listed at Wayzata Blvd. and Texas, probably on the east side of Texas. This had been built by M.P. Johnson, who bought the land from “Peanut John.” On the east side of Texas today is a block of buildings built as early as 1928. There is also the story of an eerie light reflecting off of Lamplighter Pond, with the explanation that the light comes from the lamp of the caretaker of the fox farm as he checks on the foxes at night. Uneasy about what he did in life, he was destined to walk the area with his lamp for all eternity. Lamplighter Pond is just south of the Louisiana location described above. We also don’t have a handle on when this farm was established. We do know that the area surrounding Wayzata Blvd. and Louisiana was platted in 1916 and 1917. We have a document that appears to be an advertisement to sell franchises, which pictures President and Manager E.M. Robinson in 1920. In 1930, the American National Fox and Fur Breeders Association issued the fifth edition of its Manual of the Silver Fox Fur Farming Industries. Association Headquarters is listed as 424 McKnight Building, Minneapolis. The undated photo below captioned “A Birdseye View of U.S. Silver Fox Farm of Minneapolis” shows a large circle of pens (with foxes drawn into them) surrounding a three story tower-like building. The tower was a barn where horses were slaughtered. The meat was mixed with grain, and one horse could feed the foxes for 10 days to two weeks. Village Council minutes show that neighbors on the North Side complained about the fox farm, particularly about the noise from gunshots – not gunshots to kill the foxes, but to kill horses used to feed the foxes. [This is unlikely, says our reliable source – there were very few people living up there, and those who were there did a lot of hunting, so gunshots would have been prevalent.] The Village Council found that the company was committing a nuisance by their slaughtering of animals, and the recorder wrote a letter saying as much. (The foxes were killed by electrocution.) The subsequent ordinance, passed in 1931, provides other hints at the goings-on, by requiring that the animals be property fed and otherwise cared for. More complaints ensued in 1933, and farm owner Mr. Harvey was brought before the Council and promised to move the farm as soon as he could afford to, it being the Depression and all. It was gone by 1939. Caught in the crossfire was Harald N. Johnson, who ran a mink ranch on his property. He lived at 4344 Brook Lane, which is a one-block offshoot of Brookside Ave. He came before the Council and was given a waiver of the ordinance for 1931. Johnson was a colorful fellow who told stories of driving a stagecoach out west and in British Columbia. He was a mink farmer, sausage maker at Witt’s Market House, and, in 1935, got a permit to make meat loaf… Johnson’s property went all the way back to Alabama Avenue, which explains why the houses at the end of Alabama are newer than the rest. The mink farm was surrounded by a high sheet metal fence. There was a mink farm on Hopkins Cross Road, a mile south of Wayzata Blvd., where foxes from the fox farm were moved temporarily in 1939. The foxes moved north in 1940. A curious footnote is that in 1928, a Minneapolis business directory listed the National Muskrat Breeders and the Muskrat Conservation Co.
LeRoy deBoom remembered that there was an alley with the perimeters 39th Street, Cambridge, Yosemite, and Wooddale where caged animals – perhaps foxes – were kept. That would have been in the 1940s.